Take a tour of Mount Herzl in the tracks of the personal stories that combine to create the collective story of Israel’s nationhood. The leaders of the nation – those who dreamt of, struggled for, and established the State of Israel – are buried at <?xml:namespace prefix = st1 ns = "urn:schemas-microsoft-com:office:smarttags" />Mount Herzl, alongside simple soldiers who fought and died for the founding of Israel and defense of its borders. We will tour in the footsteps of the living legends buried in this cemetery, all of whom combine to create the epic story of the State of Israel. We will hear about Herzl, visionary of the state, about Zionist presidents and leaders, and about simple, modest fighters who gave their lives in defense of the country. 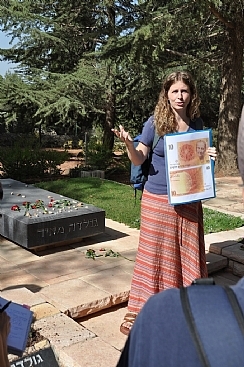 The sites of the tour include Herzl’s tomb, Helkat Gedolei Ha’uma (Gravesite of the Leaders of the Nation), and the military section of the cemetery. The tour may be combined with a visit to Herzl Museum.